The Humours of Loughrea is a sprightly traditional Irish reel that will get your toes a-tapping! 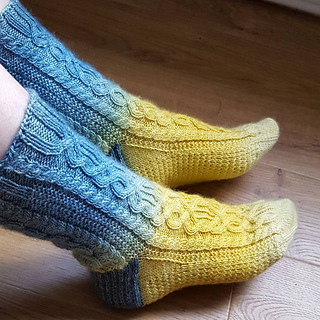 The intricate interplay of Irish traditional tunes and ceilidh dances are reflected in both the knitting style and cable design of these toe-up socks. 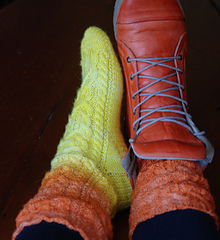 The cables in these socks match the Loughrea Hat and Loughrea Fingerless Mitts patterns. 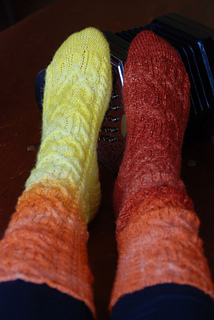 ‘Fraternal twin’ toe-up socks especially designed for the new Knit Picks Stroll Gradient yarn. Pull yarn from the centre of the yarn cake for the first sock and from the outside of the cake for the second sock. 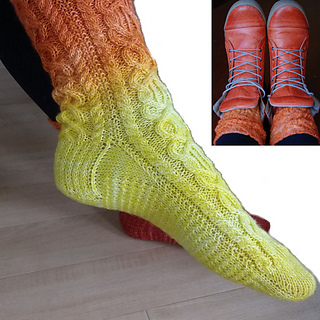 While the toes and foot will wear different ends of the colour gradient, both socks will trend to the middle colour range at the cuff. Wear with boots to keep your ‘fraternal foot’ secret or with clogs to display all the beautiful colours in this most luscious yarn. A great way to use every bit of this precious yarn cake! Beginning with a wide toe, the instep is worked in the cable pattern while the sole is worked in a ‘padded’ stitch for extra cushioning. The short-row heel cap means no picking up stitches and the heel is worked in a traditional slip-stitch pattern. 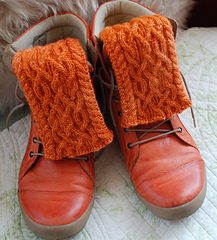 Once the heel is complete, the cable pattern continues on the front and back leg. 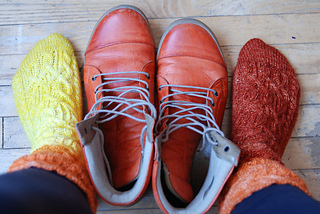 To use every last morsel of this special yarn, the sock height varies between sizes. 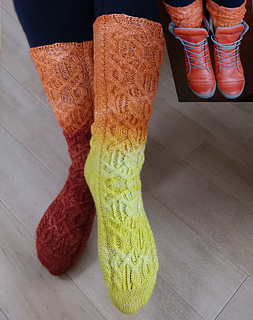 Since the pattern is full of scrumptious cables, no ribbing is added at the top; the socks are simply bound off using a stretchy bind off. Both charts and written directions for charts are provided. Individual charts are provided for both the right and left sock. Written directions for charts are provided in the supplemental PDF. 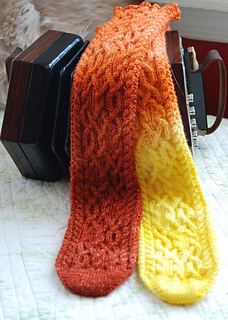 Written directions are formatted side-by side for knitting singly or 2 at-a-time (2AAT). Bottom of heel to top of leg: varies; approximately 10”/ 25.5cm. 1 cake (458yds / 419m) Knit Picks Stroll Gradient (75% superwash Merino wool, 25% nylon; 458yds per 100g) in Lion Fire. 28 sts over 4” / 10cm in Sole stitch pattern.